Improve productivity with double sided scanning. The Brother DS-720D Mobile Scanner makes easy work of scanning double sided documents, ready to be shared and organised. Powered simply by USB from your laptop the powerful industry leading software takes care of the rest. With double sided scanning you can get more done. The DS-720D Mobile Scanner combines style and design with a wide range of features. With the ability to scan a range of double sided documents including receipts, business cards and A4 2-sided documents, now your day can be much more productive. Fast. Productive. Built with you in mind. The Brother DS-720D Mobile Scanner captures two-sided business documents, as well as receipts, business cards, invoices, photographs, and more. 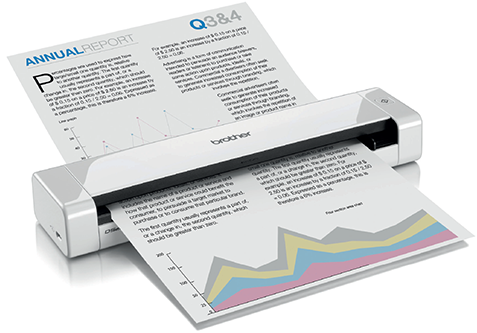 It scans at up to 1200×1200 dpi resolution (interpolated) and 600×600 dpi (optical), with fast colour and black scan speeds of up to 7.5ppm, 5ppm duplex.